Brittany H. Lee currently serves as the Vice President and Farm Manager of Florida Blue Farms, Inc. a 110 acre Southern Highbush blueberry plantation located in Northeast Florida. Brittany also is a Sales Representative at Florida Woodland Group, a real estate firm based in Gainesville, Florida that specializes in the sale of rural/agricultural properties. Brittany is a licensed real estate agent in both Florida and South Carolina. Brittany is heavily dedicated to and involved with various community service and industry organizations both locally and statewide. 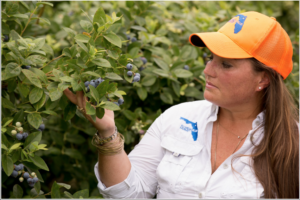 She is currently President of the Florida Blueberry Growers Association, and was appointed by the US Secretary of Agriculture as the Florida delegate for the US Highbush Blueberry Council. She participated in the Wedgworth Leadership Institute for Agriculture and Natural Resources program, Class IX; she serves as a board member for the Alachua Farm Bureau, Young Beginning and Small Advisory Committee for Farm Credit of Florida, Wedgworth Advisory Board and has served on the Governmental Relations Committee and Membership Committee for the Florida Fruit & Vegetable Growers Association. In recent past she has also served in a board capacity for Connect Florida, the NorthEast Regional Council of Leadership Florida, the Junior League of Gainesville, Reeling for Kids – Benefitting the Boys and Girls Club, the Ronald McDonald House of North Central Florida Executive Board, the TitleTown Gator Club and the University of Florida Young Alumni Council. Brittany is an active member of the Florida Farm Bureau, the Florida Fruit & Vegetable Growers Association, the Florida Blueberry Growers Association, Connect Florida Alumni Association, Leadership Gainesville Alumni Association, the Gainesville Women’s Giving Circle, the University of Florida Alumni Association Lifetime Member, and the US Highbush Blueberry Council. In the past several years, Brittany has participated in several Leadership Development programs and conferences; she is a graduate of Wedgworth Leadership Institute for Agriculture and Natural Resources (Class IX), Connect Florida (Class II) and Leadership Gainesville (Class 34). In 2016 Brittany and Florida Blue Farms received the CARES award for Environmental Stewardship. In 2017, Brittany was awarded the Florida Farm Bureau’s Young Farmer and Rancher Achievement award and she accepted the Commissioner of Agriculture’s Environmental Leadership Award on behalf of Florida Blue Farms, Inc.
Brittany earned her Bachelor’s Degree from the University of Florida, and resides in Gainesville with her husband Ryan Brown, their son JEB and Weimaraner, Carlos.